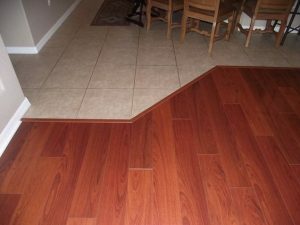 Today the laminate is the most urgent and demanded flooring which can be used almost everywhere in the house or apartment. However, using it in the hall or kitchen it isn’t very practical and it is reasonable decision. For such rooms the ceramic tile will be the best option. However laminate in the kitchen can be used in the dining area, and other part of the room can be covered with tile. In order the joint looked accurate and beautiful, it needs to be hidden qualitatively. Specially some times that the tile and a laminate can differ among themselves on thickness. Therefore, they need to be spread at one level to receive smooth transition. Don’t forget to leave a small gap between laminate and a tile because laminate can extend or contract (temperature difference and humidity). 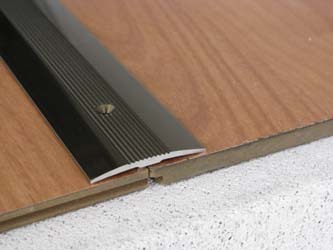 Convenient and most popular method to close up a joint between a tile and a laminate – installation of moldings. Today the huge choice of powders is offered to you. They various on material: plastic moldings, wooden moldings, metal moldings or aluminum, etc. Wooden moldings are the most popular, and also environmentally friendly and the most beautiful. They perfectly approach a laminate. It can be noticed even on a photo. However in case of everything at the same time they yield on flexibility to plastic powders. And therefore they can’t be applied in case of a wavy joint. When they showed up on the market they became popular and demanded very quickly. They bend well, taking the necessary form and protecting a joint from dust and dirt. If you want to use stronger material for moldings, then choose metal. Metal moldings perfectly approach any interior as it is possible to choose necessary color of material from the variety presented at the market. Metal molding can look like laminate or tile (can be colored). 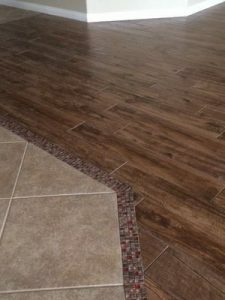 If there was a situation that the laminate and a tile lie at the different levels, then in this case you can use different-level metal moldings which will help to smooth difference. Aluminum moldings are used generally in case of equal height joints. And rubber moldings will be suitable for wavy joints better. This are the best materials for DIY and can take only several minutes. Just don’t forget to leave 0,5 cm between materials. To fix the molding just unscrew coupler for screws in advance. For closing of wavy joints of various materials it is possible to use also flexible molding. It is established on a plastic profile with cambers by means of which it fastens over flooring. Additional fixing with screws will be required. To make the molding more flexible, before its installation you can put it the molding in warm water approximately for about 20-30 minutes. What kind of underlay to select for laminate flooring?